David Walters is an English architect, urban designer, town planner and a tenured full professor at the University of North Carolina at Charlotte in the USA. Walters qualified as an architect in 1972 after completing undergraduate and graduate degrees with honors in architecture and urban design from the University of Newcastle-upon-Tyne. For eleven years Walters taught and practiced in England, where he won national awards for housing and urban design. In 1983 he resigned his Senior Lectureship at Plymouth Polytechnic, now Plymouth University, and moved to the USA, teaching and practicing in Mississippi, Arkansas, Texas and Oklahoma before joining the Charlotte faculty in 1990. He has helped many North Carolina towns to create new town plans and zoning ordinances that incorporate “Smart Growth” development practices, and his work in the towns of Davidson, Cornelius and Huntersville in north Mecklenburg County has been featured in a PBS documentary. In 2001, Walters wrote sections of a "Smart Growth Toolkit" for the Atlanta Regional Commission on Traditional Neighborhood Development and Transit-Oriented Development. Since becoming Senior Urban Designer at The Lawrence Group, headquartered in St. Louis, MO and with an architecture and town planning office in Davidson, NC, Walters has been the lead urban designer in multi-disciplinary teams that have won six regional Smart Growth planning and urban design awards and one national planning award for master plans, form-based codes and development "toolkits." Walters is the author, co-author and editor of four books: Design First: Design-based Planning for Communities (with his wife, artist and writer Linda Luise Brown) published by The Architectural Press (UK) in 2004; Designing Community: Charrettes, Masterplans and Form-based Codes, published by The Architectural Press in 2007; The Future Office (with Chris Grech), published by Taylor and Francis in 2007; and The Southwestern Commission's Region A Toolbox, (with colleagues at The Lawrence Group) an exhaustive handbook that provides detailed analytical tools, policy advice and illustrative designs for environmentally, economically and socially sustainable development in the mountain landscapes of North Carolina, published in 2009. 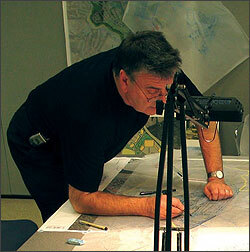 Walters is also the Director of UNC-Charlotte School of Architecture's new Master of Urban Design graduate program. Copyright ©2009 David Walters. All Rights Reserved.